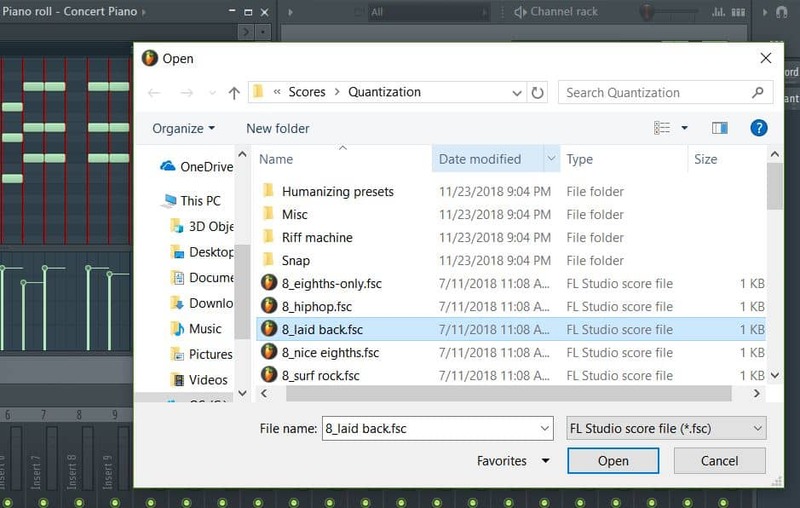 What Does it Mean to Quantize in FL Studio? “Quantize” can mean a few different things depending on who you’re talking to. To mathematicians and engineers, quantization is a process that takes continuous data such as an analog electrical signal and converts it to an approximated digital signal comprised of discrete points at set intervals. This is what’s going on inside your Analog-to-Digital (ADC) converter. The estimation results in what we call quantization error, and can differ depending on the quantization method used. Although quantization in signal processing is still very important to understand for anyone involved in digital music production, the type of “quantize” this FL Studio tutorial will cover is not that kind. To musicians and beatmakers, quantization is the process of transforming imperfect MIDI data from a live recording into perfect grid snap intervals. We can do this using either the Quantize tool in the Piano roll or the Quick quantize and Quick quantize start times shortcuts, or by setting up Input quantization during recording. Let’s take a look. When someone plays an instrument, there is a certain degree of human error in the timing and velocity of each keystroke, pluck, or hit. Usually this is desirable when we want to create something that sounds live and realistic. But sometimes, the error is too much and the piece just sounds bad, or we just really want it to be perfect on purpose! This is where quantization comes in. First, add a generator like Sytrus or Harmor to the Channel rack. Then, set your Recording filter to record notes and automation only. Next, turn the metronome on to keep time, and click the Record button. When you’re ready, just hit the Spacebar to start recording MIDI data. Contrary to popular belief, I am not a cyborg. Consequently, we can see and hear that the recording above has note starting points, lengths, and end points that are slightly off. It’s a little sloppy. If I had a few beers prior or wanted it to be perfect, we’d use quantization to quickly clean things up. Make sure the Piano roll window is selected, and hit Alt+Q on your keyboard. Alternately, you can get to the Quantize tool through the arrow at top left of the window → Tools → Quantize. Quantize duration – aligns the note lengths to the red quantization lines, and makes the notes have the same starting times and end times. Quantize end time – snaps notes to the red quantization lines and makes the notes have the same end times. Leave duration – snaps the start times to the nearest red lines, but retains the lengths of the notes. Leave end time – snaps the start times to the nearest red lines, but retains the note end times. The Sensitivity knob controls how close a note needs to be to a red line for it’s start or end time to snap to that line. Almost too perfect… but OK. Let’s take a look at some other cool quantization features. Groove templates are files within FL Studio that can change how your red quantization lines will look and behave. Groove templates also change the velocities of some of the notes. To access the list of Groove templates, just click the arrow or folder icon at the top right of the Quantize tool window. I suggest picking a few and experimenting a bit. Some of them can yield pretty interesting effects! This one gives you the best of both worlds. You get the perfect start times with a sprinkle of humanity with uneven note lengths. Note: Quick quantize (Ctrl+Q) will quantize start times and end times, and alters the duration. If you’re serious about quantization, you should already know about this. FL Studio allows you to quantize your notes as they’re being recorded for some seriously next-level productivity and workflow. You can even quantize automation clips and events. Sit and watch in awe – it’s already been quantized! Quantization is a great way to quickly line things up in your recorded MIDI data. In this FL Studio tutorial, we learned about four different ways to quantize. You can use the Quantizer tool (Alt+Q) for a more refined approach, Quick quantize (Ctrl+Q) and Quick quantize start times (Shift+Q) to save some time, and even quantize instantly with Input quantization. Awesome! Thanks for reading, and I hope you learned something. If you liked this 100% free FL Studio tutorial, let me know what else you’d like me to cover in the comments, on the Synaptic Sound Facebook page, or YouTube channel.